WAND's product and service taxonomies cover all the types of products that a company may make. We have coverage of products for every industry and any company. Now, we have developed a manufacturing taxonomy to cover topics about how products are made. This taxonomy is ideal for any company with a document management project, perhaps in SharePoint 2010 or Oracle UCM, and needs to tag these documents based upon manufacturing processes or concepts. 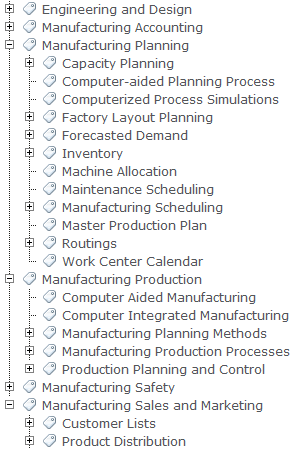 Initial feedback on this manufacturing taxonomy, which has nearly 450 terms, has been terrific. 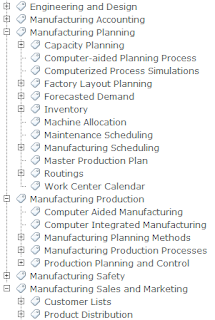 The manufacturing taxonomy covers manufacturing processes, quality control, manufacturing sales, manufacturing accounting, engineering and design, planning, and more. One client who reviewed this taxonomy commented that it could be combined with the WAND IT Department Taxonomy to create a product development taxonomy.